Rings: some old weaver see-through rings I had in my bench because I forgot picatiny rings might not fit on weaver rails but weaver rings fit on picatiny. It's solid and temporary. Sandpaper $0 because all men should just have sandpaper anyhow. 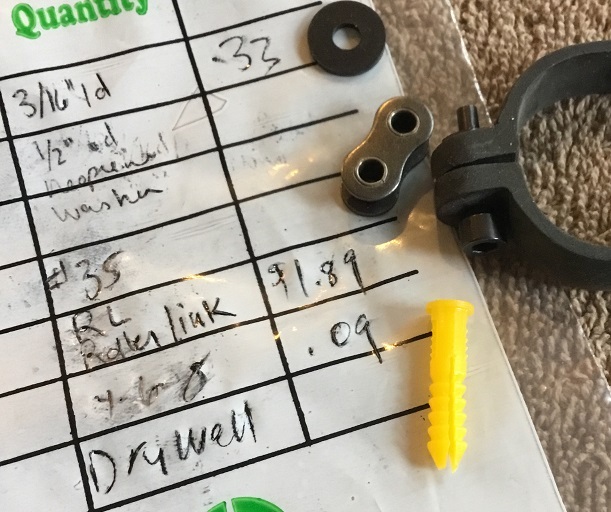 Bicycle inner tube shims are .032" and I had some 0.018" latex physical therapy bands around which are much more uniform, pretty and also free. 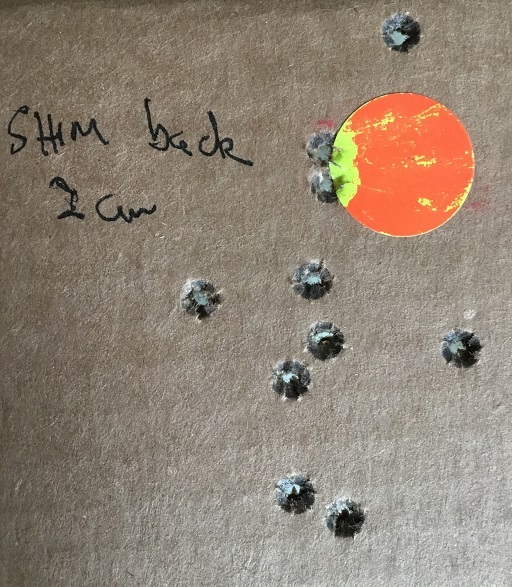 1.5" group (10 shots, Thunderbolt) at 25 yards. Barrel Band is touching the barrel via another strip of 0.018 latex rubber sheet. The barrel now free floats with only a 0.018 latex shim 2" or so in front of the receiver. 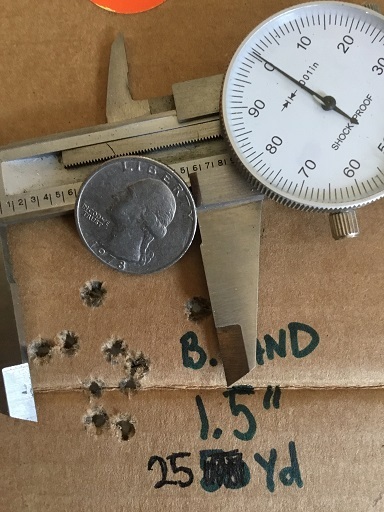 0.98 " group at 25 yards, same Thunderbolt. Note that group is shifted 0.5" vertically, probably due to releasing the pressure from the barrel band. The barrel band is still in place for cosmetics but sandpapered (see above) for ample clearance in all dimensions. On a positive note, near all my Thunderbolt has been expired and Gander Mountain has a sale on Aguila SV for $1.99/50 while Cabela's had CCI Blazer bulk packs cheaper than Thunderwhump bulk and I was shopping for boots anyhow. No luck on the boots, but looking forward to getting to the range again soon to start testing ammunition effects. So far I am very impressed with the little 4x Simmons 22 Magnum scope. 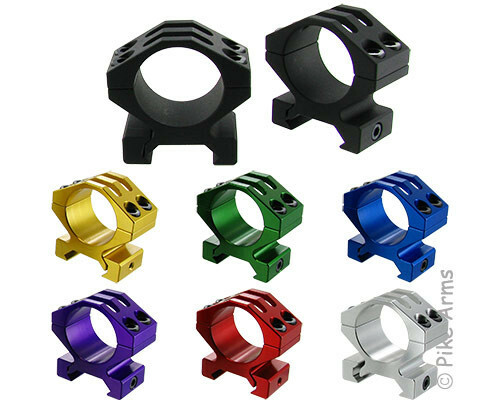 As pretty as the bright scope rings above are, it's hard to justify paying twice the price of your scope on scope rings! Those are beautiful beautiful parts. If you die, you are going to have to explain the purple ones to Bill Ruger when you meet him in heaven. For this build, I intend to do as much work and modification as possible/practical using hand tools or supplies such as one can purchase at a hardware or auto parts store or cheaply purchase online. For example: if I need to anodize I will have fun learning how, or explore ceracote, powder coating, auto paint or crayons. I mean lacquer sticks. I made a beautiful turquoise and leopard skin pattern ar-15 space gun about 15 years ago that was considered heresy in the ar “tactical” world. One guy said “It looks like something the San Francisco swat team would issue!” This intended insult pleased me as I am the opposite of Tommy Tactical and as my build was so easily sub moa, there isn’t any need to get defensive when you are a guy shooting nickels off a 2x4 100 yards away. I quickly lost interest as the club that has a 400 yard range is a lot farther from my house. I get to think hard about my trigger. Clearly the gold standard is the Kidd 2 stage. The Ruger BX trigger has some philosophical merit as it’s a Ruger part and has the magic “bx” stamped in it such that it’s easy to resell on eBay to some rube (I mean “nice young feller”) once moving on to better or after reverting the rifle to stock trigger for selling/trading purposes. (Postulate: all used 10/22s are worth almost the same no matter how much we sink in to them.) Maybe my build starts with honing my own trigger job? One thing is for sure, this build is not about doing anything the best and easiest way without hilarious misadventure on the way there. If I may make a suggestion, dont get rid of any original parts. Eventually you will have replaced everything and will be able to reassemble your original gun. At that point you will have come full circle. Someday you will return to the place you started and you will truely know that place for the first time. Edit: the above is not exact but paraphrased from T.S. Eliot. Btw, there is a nice little new DNR pubic range in Columbia Cty just off Hwy22 a bit to the east. Last edited by gcrank1; 03-23-2019 at 06:44 PM. Your post moved something in my spirit. I'm feeling overwhelmed by the the feel good feeling.. I'm back where I started.. I've crossed over into another dimension..
Life will never be the same again..
You are spot on with my thinking and this is my second 10/2 build. The first was a rescued project my Dad lost interest in. 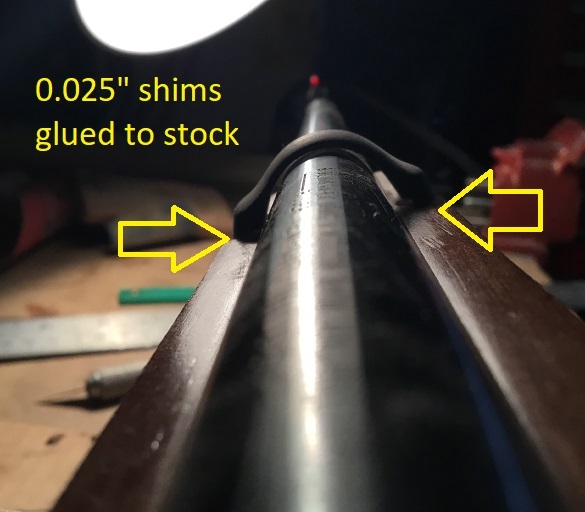 The first go-round had a beautiful laquored thumbhole target stock made by a NC smith named Ricky Evans who was aces at tuning M1s. When I got the gun it was fairly well along but had a stock stainless carbine barrel sticking goofily in a stock built for a full bull barrel. I bought and installed a stainless “recognized name” bull barrel. The accuracy went in the dumpster. I fiddled, fussed, tried everything to see what other thing I had messed up. After weeks back and forth to the range (I belong to the Stoughton Conservation Club) I finally swapped the old barrel back. Shazamm. Accuracy returned. In frustration I sold the gun for less than I should have after putting the proper looking bull barrel back on and started building some varmint ar rifles. Being able to reload is a lot less irksome than buying all kinds of ammo and hoping to find the magic beans! Over the winter, I had this idea about making a logarithmic spiral fluted AR barrel by hand. I had that stainless 10/22 barrel and reckoned best to try in that first. As he had just bought a bunch of revolvers from me I was glad someone who appreciated it got it. He said it was still a shooter. I may repeat that spiral fluting when I get to the “dress it up” stage and that’s why I bought the second barrel for $10 more than the fiber optic sights. Of course, the weaver rail makes using iron sights a whole new project to buy or make iron sights tall enough to see over the rail. So maybe I spiral flute the barrel, remove the rear sight and make a steel filler key and remove the front sight and take off the slotted post with a file! Maybe someday... but it’s time to move the ruger to the 50 yard range where it’s CZ 455 American cousin has been shooting this whole time. The CZ is only 2 weeks older than the Ruger. It’s (honestly) much better loved but it’s also the sort of gold standard. If I can shoot the Ruger and it keeps up with the Cz, I will declare victory. I have no doubt a lot of guys have the skill and the rifle to dust my CZ sporter... but I think it’s a legit sort of goal to begin with. Then we see what’s next! Learned more than I cared to at the range today. Progress: new low Tasco (generic Chinese aluminum mounts) swapped in. $9.00 shipped. Luck was on my side and very close to point of aim right off the bat. Immediately and obviously gross vertical stringing. Something is wrong. Remove the barrel band (which should be completely a free floating decoration.) Groups tighten up and get round. Huh. On closer examination, the fit of the barrel band is not foolproof. 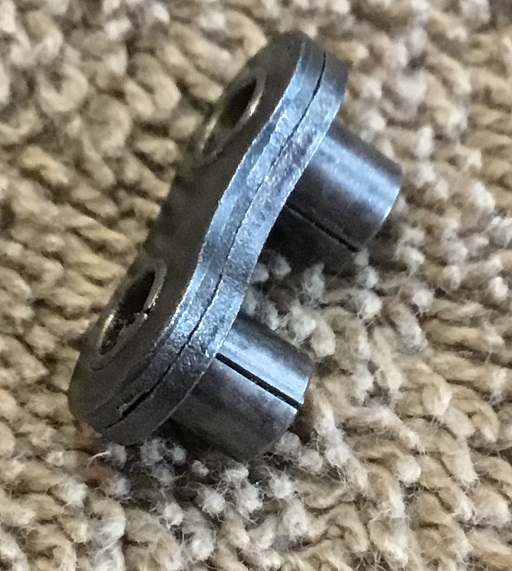 There is enough play in the fit that where the band is when tightened, screw torque, and how it’s nudged or twisted by hand can easily result in a point of contact. So... barrel band off, we move up to the 50 yard range to test some ammo. 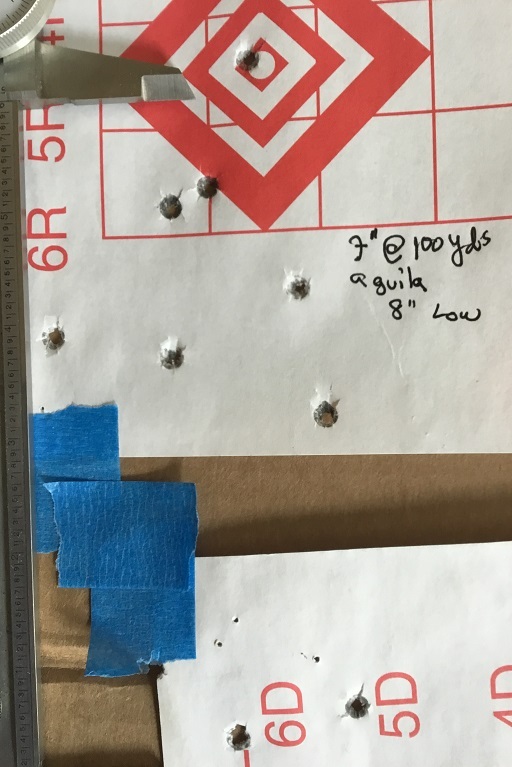 CCI Sv... 20 shot group... a little disappointing. Okay, try Aguila SV. I have yet to see any much difference in any other gun I have between CCI and Aguila SV except for maybe a little poi shift. Wait. What? What??? I can’t believe it. Walk 50 yards down. Yep, the Aguila group (10 shots) looks half the size of the CCI group. Huh. Probably just a lucky group. Let’s put 10 more on the same target. Result: group size no bigger but ragged hole developing in the middle. Huh. Bad box of CCI? 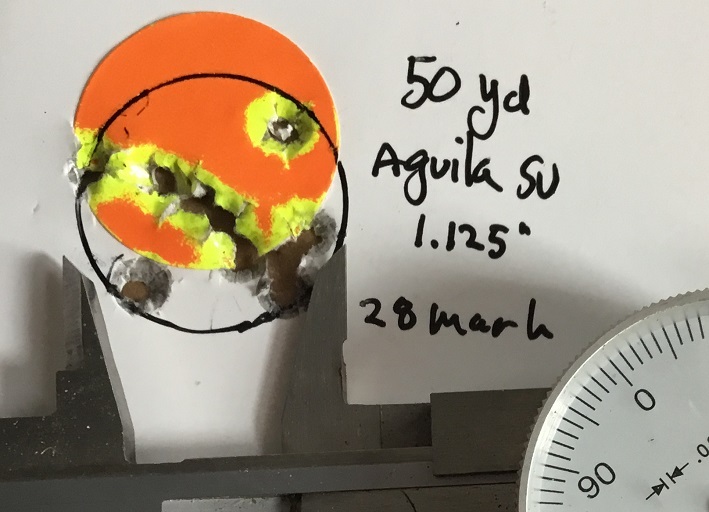 So: the 10/22 seems to really like Aguila Sv. I will try to repeat next trip. I would guess 1.5” at 50 yds but like an idiot I forgot my paper on the bench at the range. The barrel band is really bothering me. I will ponder a solution that is pleasing to my soul. I forgot my paper. Grrr. Yes. Exactly. I did exactly that. What I failed to explain clearly is that even with the clearance tunnel sanded, wobble in the band makes it possible under some handling conditions for a point to touch the barrel. My problem: How to stabilize the band such that even under rough handling the clearance channel remains clear. I am going to try some shims. I really hope that works. If it doesn't work, one idea was installing a sling mount (probably made from hardware store parts) such that the eye of the sling mount aligns exactly with the eye of the barrel band. The sling mount would be sufficiently thin to fit exactly in the barrel band gap. Then I got to thinking about making a double-eye sling mount machine screw so that it also can actually.... mount a sling. In order to get the precision I need, I think I would through-drill perpendicular to the barrel channel and install with two nuts so that the elevation can be fine tuned to perfection. That level of fussing for a stupid barrel band is either brilliant or idiotic. I think I would need to untemper the screw, file it to shape, then harden it and blue it. Wait... I just looked in my parts jar. I have a 3/8" stainless surfboard leash/skeg screw that just might work. I mean, doesn't every guy in Wisconsin have a couple of surfboard leash screws just laying around? Last edited by Stinkeypete; 03-25-2019 at 09:14 PM. The barrel band clearanced for the barrel and not overly tightened shouldnt impart any barrel tension(s). If you must have/use a sling for rec purposes it could be mounted up front to a typical stud for QD swivels right behind the band. If you want to use a sling for something like Appleseed but it makes your scores drop more than shooting without the sling, well, dont sling it. Problem: after free floating the barrel, the barrel band (sanded inside for free float clearance) can be bumped such that it contacts the barrel. The result is distinct inaccuracy pattern. Overview: As the barrel band is tightened to various torques, the U shaped forend serves to draw the top of the barrel band towards the stock, contacting the barrel. The inside dimensions of the barrel band shelf allows for some play in location. 1. Go to the Ace hardware store and buy a #35 RL Roller Link for $1.89. This is the perfect size for several reasons that will become clear. 2. Use your cheap vice and a nut or something to use as a crude arbor press. Smush the roller link side plates firmly together. 3. Drive one of the roller pins out with a punch. It's the perfect clearance diameter for the Ruger Barrel Band Bolt. Leave one pin in, it's the perfect clearance diameter for a sling swivel. Cut the remaining pin flush with the plate with a Dremel tool. It's fun to Dremel on something where it doesn't matter if you screw it up! File and wet sand to proper thickness, add cosmetic beauty. Cold blue. Blow off shop dust on the top of the piece before photographing. I forgot that part! 4. Install. The link can be in any position, I just put it like this to be out of the way until I need a sling. As there is a steel spacer now, torque on the screw does not affect the barrel band dimensions. glue some shims to the stock to eliminate play at the barrel band shoulders. The barrel band is rock solid and doesn't come close to the barrel now in any circumstance. Next post I will verify that this worked as intended. I saved $6.11 and since I have some surfboard skeg screws that double as leash mounts, I don't need the other parts. No point in making this easy! Several days ago I had some good success with my groups by removing my barrel band. Then I forgot my target at the range. By good fortune, my target was still there when I went back! 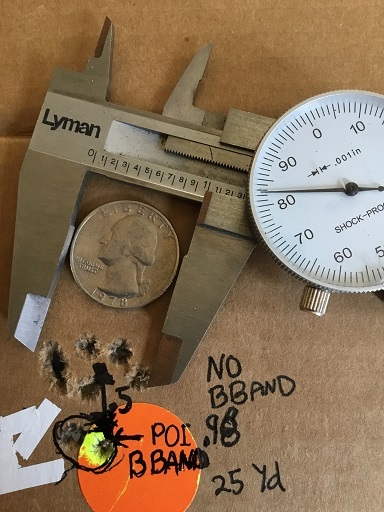 the 1" diameter black circle is NOT the target, it's for reference only. As this is a 20 shot group, I was feeling pleased. Leaving my targets in the bunker, I spent my time McGyvering the barrel band (see above) then managed to knock the rifle over on to the concrete shop floor, making a sickening clatter. (insert bad words here). Back to the range with my new, solid, free floating barrel band. Fairly sure the scope had been bonked, I used the last 5 of a box of Aguila SV to zero the scope. Surprise! The scope held it's zero! For dirt cheap, this fixed 4x Simmons 22 Magnum scope continues to impress! 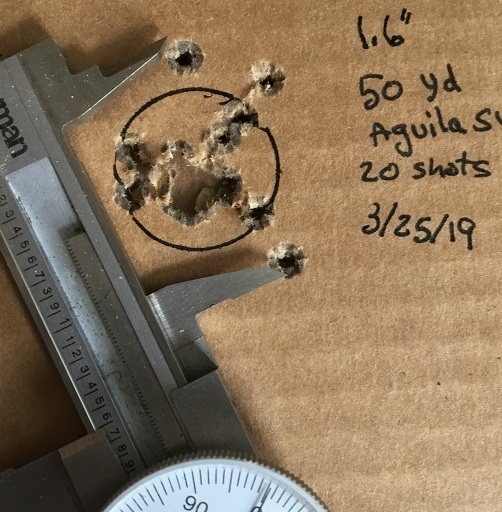 Starting a new box of Aguila SV, 10 shots at 50 yards. The target is the orange dot, the black 1" circle is for reference. 1.125" outside edge- O.E. That's really not bad. Not bad at all for a $211 rifle with a $20 scope and $9 in rings. 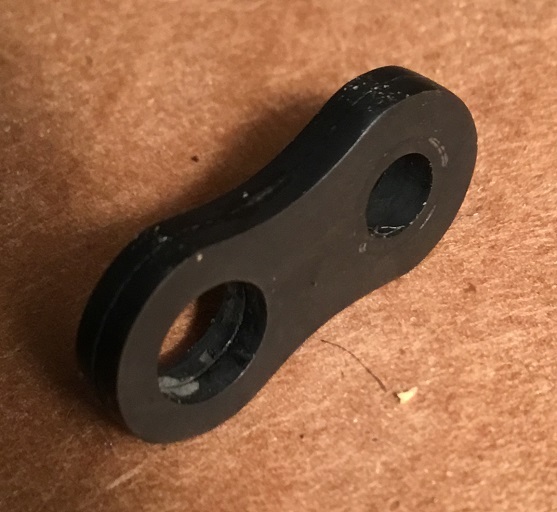 And a $1.89 roller link spacer/sling mount. Hmmm. Okay. Today's plan was to move the 1" wide latex shim that I have between the stock and barrel about 3" ahead of the v-block. I moved the shim back about 3/4 of an inch. The barrel tapers near my original location. 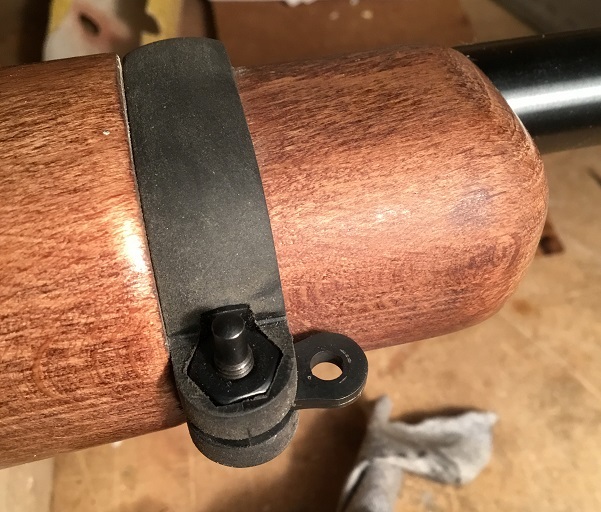 The barrel and receiver had to be removed from the stock to move the shim The shim was stuck fairly well to the barrel and had to be peeled off. What did I get? Vertical stringing. Let's move the shim back! What do I get? Vertical stringing. 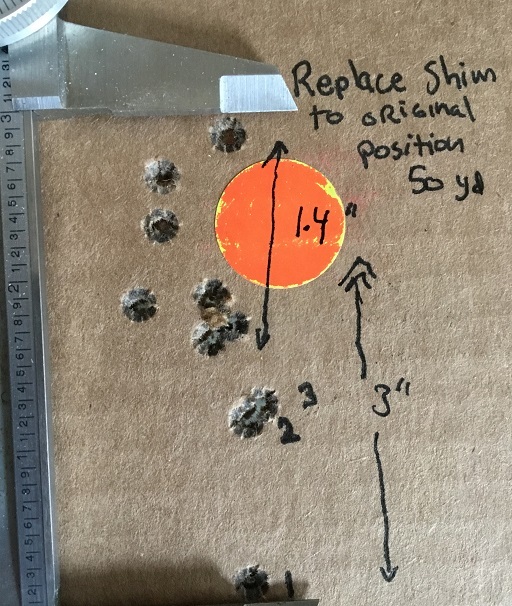 Based on the experience of first moving the shim, I watched the shot 1 as the lowest, shot 2 and 3 and 4 walking up to the original point of aim. What did I learn? Removing and reinstalling the receiver creates instability. My hypothesis is that with time, heat and pressure the latex shim will get us back to those initial fine groups. So, the CZ is a bad influence and was whispering in my ear "100 yard range! 100 yard range! All the cool kids want to shoot at the 100 yard range!" So.. we moved over to the 100 yard range. point of impact is still walking, I think. I can no longer see the holes in the paper at 100 yards without a spotting scope. my point of aim is at a target square something like 8" about where the holes are printing. Hitting the bullseye was gratifying, but pure luck. I'm now convinced that imprecise bedding of the receiver and barrel are the next area to investigate and work on. My 4x scope is struggling at 100 yards. 22 LR is starting to get a little parabolic at 100 yards. Test results at 100 yards are much more obvious. Lack of shooter skill is definitely coming in to play, but I am having fun and I think improving. I am in awe of guys here that shoot their little groups at 100 yards. Clearly, it's not just double 50. While reading up and thinking about bedding and tang hold downs and stuff, I think I will swap barrels back to the original factory barrel, drill a cleaning hole (which I want because really, they should just come that way), and test again to see if I can get back to where I was a few days ago.